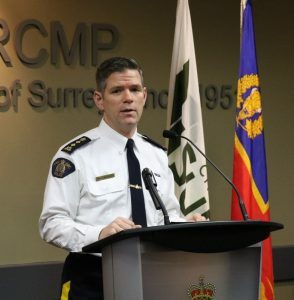 SURREY RCMP’s Officer in Charge, Assistant Commissioner Dwayne McDonald, on Thursday thanked the media for their help in the search for Daon Glasgow who allegedly shot a Transit Police officer last week. ON behalf of all of us at the Surrey RCMP I would like to thank you for your professionalism, compassion, and assistance during our recent investigation into the shooting of Metro Vancouver Transit Police Officer, Constable Josh Harms. Over the years, your agencies have been key partners in helping us distribute valuable information to the community, and the value of our partnerships were proven to an even greater extent with the coverage you provided us beginning on the evening of January 30, 2019. With your help, the public stayed informed during the search for Daon Glasgow, and quickly learned of his arrest in the early morning hours of February 3, in Burnaby. You did this locally and by using your networks to broadcast across Canada. While we were on opposite sides of the camera lens, it was apparent throughout last week’s incident that we shared a commitment to keeping the public safe, and bringing a dangerous suspect safely into custody. Thank you for your continued efforts to keep the public informed and safe.